I recently came across an old but intriguing article I just had to share with you – all about the great reasons to chew gum! “Something to chew over… the health benefits of gum” by Alok Jha, The Guardian International, Thursday, March 30, 2006. Email them to me at gleeguy@gleegum.com and we can discuss! Ciao for now, my fellow chew-ers! Turn on the telly this Tuesday; you´re in for a doozy! Why? Because on Tuesday, April 15, 2008, my beloved Glee Gum will be featured on Rachael Ray´s Daytime Talk Show as the “Snack of the Day”! It´s incredible! It´s ingenious! It´s almost too wondrous for words! GOOD GRACIOUS!!! I must try to control my excitement. Lacking a torso as I do, I tire rather quickly. For showtimes in your area, check out the Rachael Ray Show website! And don´t forget to tune in Tuesday! I’ve been thinking of you, and missing you something awful. I really need to get out more – though it’s tricky to do when you’re stuck on the side of a box, like me! In order to keep in better touch with all my gleeful pals and gals, I’ve got a new plan: I’m going to start spending time on the Internet! It sure is a wild and wacky place, but it seems like there is a lot of fun to be found there. You can befriend me on Facebook – just search for “Glee Guy”! And when you’re done, come visit my super swanky Myspace profile. Whatta hoot! Send an email my way by writing to gleeguy@gleegum.com. I have no doubt it will be grand to have friends all over Internet-Land! Hello and Woo Hoo! What news I have for you! I can barely contain my glee over this latest scoop – we are introducing not one, but TWO new flavors of Glee Gum! Everyone loves Glee Peppermint, Tangerine, and Cinnamon Gum. But just wait ‘til you get a load of Glee SPEARMINT and Glee BUBBLEGUM FLAVOR! They are both, in a phrase, the bee’s knees! Your eternal devotion I must swear! Worthy of cheers and great hullabaloo! On second thought, I’ll just chew some new Glee Spearmint and Bubblegum Flavor Gum. This stuff is the greatest! Look for it soon at a store near you, or buy it right here on our website. Happy chewing! Greetings to all my gum chums and candy comrades! Welcome to my brand new BLOG! I am just tickled pink to be writing to you all… At least, I would be if I weren’t already black and white and read all over! Golly gee, did I just make out an audible groan? I better admit something to you now, before we go any further with this blogging business – I’m a bit of a square! And I like jokes that are wholesome and, at times, wholly unoriginal. I also enjoy quiet walks in the rainforest, jumping for joy, and chewing gum. But not just any gum – GLEE GUM! If you’ve found my blog, chances are you know all about my nifty, all natural Glee Gum — and possibly my Make Your Own Candy Kits too! I call them mine, but really I’m just the mascot. And a rather dashing mascot, I’m told! I try not to let all the praise go to my head. After all, as you can see, my head is rather size-able already! It may surprise you to learn that working as a mascot can be really tiring. But when you love the products you represent, it is a genuine pleasure! Still, sometimes I wish I had a great Glee Gal to share it all with. I’ll keep you posted as to any developments in that arena. 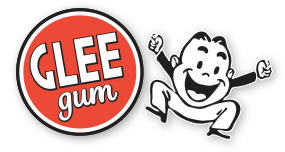 In the meantime, please stay tuned for lots of info about Glee Gum and Candy Kits, including new flavors, promotions, and more. I’m also on the lookout for neat news to share on natural candy, the rainforest, sustainability, eco-living, green business practices, and oodles of other swell stuff! Thanks most sincerely for reading my very first blog. So long for now, and see you SOON!